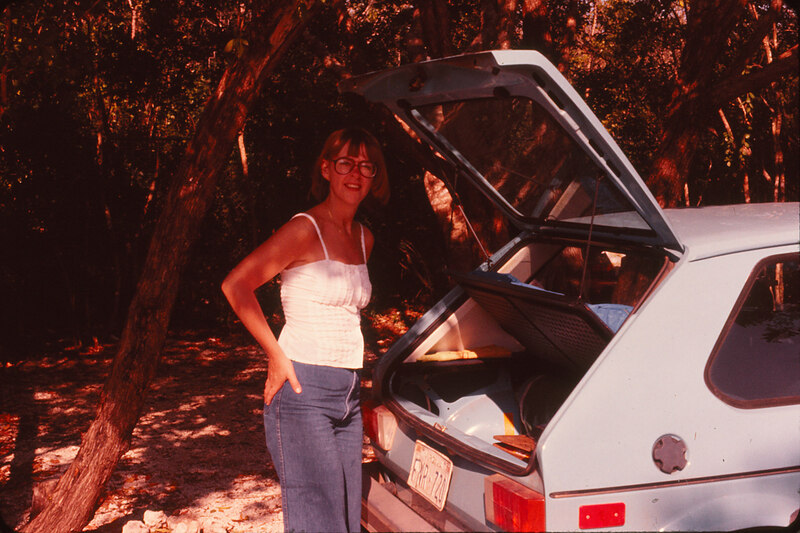 On the day I was born, I came home from the hospital in a 1977 VW Rabbit. I mean, I would have, except that my mom was in labor long enough to get the Rabbit towed. Therefore, I actually came home in my Granddad’s car. (The first thing my new dad had to do was get that Rabbit out of the impound lot.) 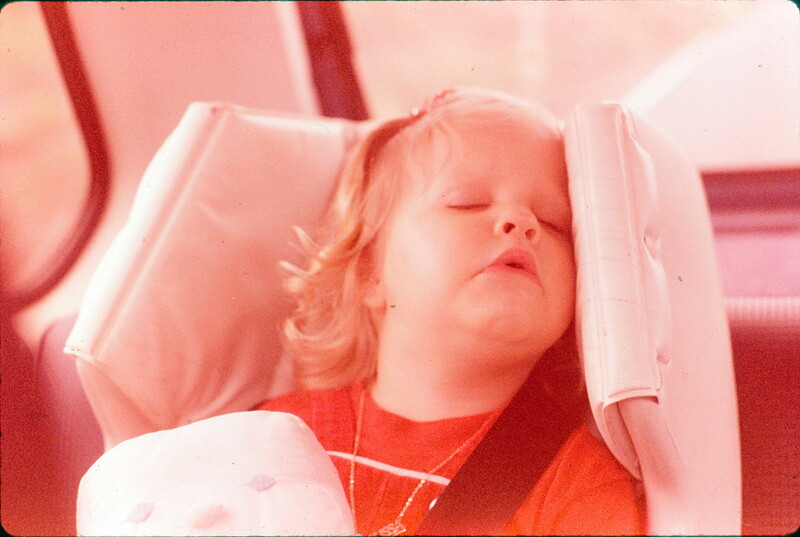 With the exception of that day, I have been in a VW for my entire life. -a maroon 1994 VW Jetta (which my brother crashed). I never thought I would not own a VW. Is there anything more bland than those three words put together: “Beige.Chrysler.Minivan”? I feel like I need to sprinkle some Sriracha sauce on those words to spice them up. We, of course, started out by looking at the VW minivan, the Routan. Don’t even get me started on that. VW stuck a dagger in my heart. The Routan is actually just rebadged Chrysler Town & Country minivan with a more expensive price tag. WTHeck, VW?! That is not acting like “The People’s Car”, now is it?! How could you do that to a lifelong VW girl? However, since the Routan debuted in 2008, it is not old enough to be affordable for the Okayest Family, so my whole rant is meaningless anyway. We don’t do car payments. Mr. Okayest is a former mechanic, and, thus, we rotate through old vehicles. He can keep them running. We have owned a dozen cars since we were married, many of which we flipped like real estate. Not a single one of them has ever been to a shop. (This hobby/skill keeps Mr. Okayest very busy. I used to call myself a “Garage Widow”.) Therefore, when we look at vehicles to buy, we usually look at vehicles that are about a decade old. This limits the choices somewhat. I am so not reinventing the wheel here. 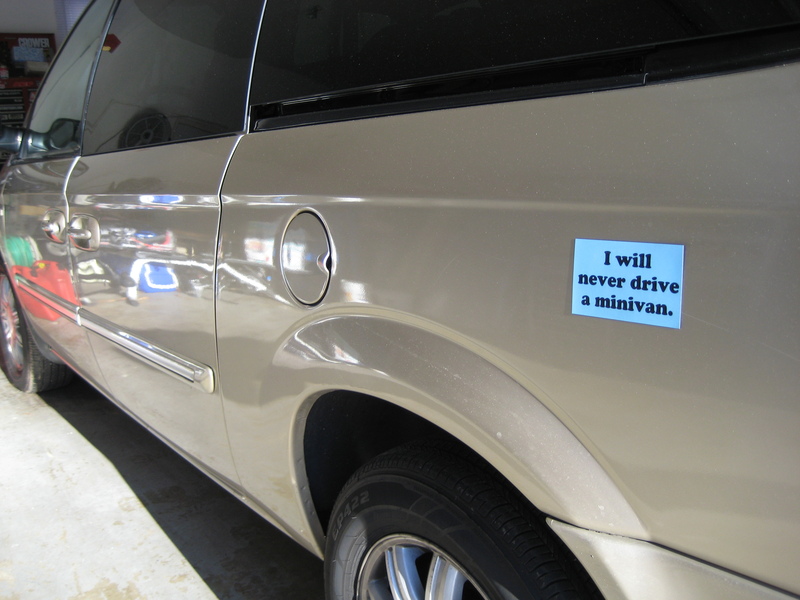 Like most minivan owners, we tried everything to avoid this thing. We smashed all 3 in the back of the VW Passat until we could smash no more. We did spreadsheet after spreadsheet to try to fudge the numbers and make an SUV come out on top. Mr. Okayest is the best practical thinker you have ever seen, and made jaw-dropping “Decision Matrixes” (matrices?) that gave every pro and con a numerical value. It was so easy to make fun of him and his Excel skillz, but, dang, I was in awe. We simply could not argue with the numbers. No matter how we skewed the values, we could not make the SUVs or full-size vans come out as the winner. Anyone who makes fun of Americans for driving increasingly-larger vehicles does not have three babies in three carseats. (And I’m talking to myself here. I am the girl who once owned a Mini and a VW Golf at the same time.) 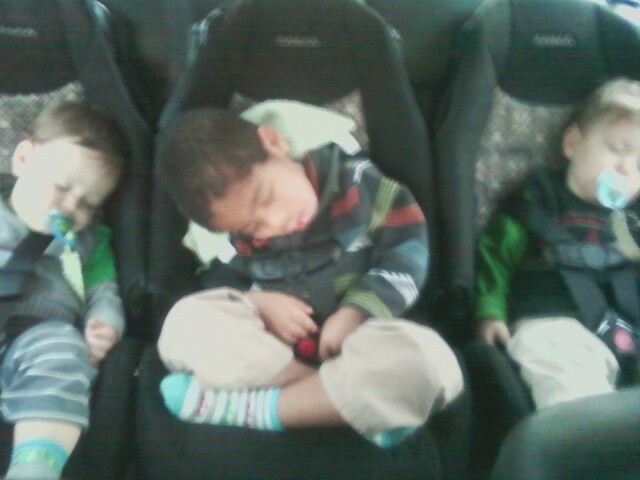 We got the narrowest carseats we could find (which also happened to be the cheapest, woot woot! ), and we just could not make them fit properly in the back of the VW Passat. There are only 2 LATCH anchors, so car manufacturers think it’s only necessary to save the lives of 2 of our 3 children. Our three carseats across the back row didn’t quite fit properly. They were a little wonky and crooked, because they had to overlap a little bit. Plus, when we shut the doors, the seats would jostle around. I kept picturing being in a t-bone crash with the twins’ seats smashed against the doors, and I felt like I should apologize to everyone who ever owned an SUV “for safety” that I had previously teased. I’m never going to be able to find it in a parking lot. As a girl who is used to driving around in rare cars (Passat W8), race cars (my husband’s 626 hp racer), or handmade cars (an old Mitsubishi Galant sedan with race components), I now feel like I am wearing an invisibility cloak. Good thing I never leave the house, huh? 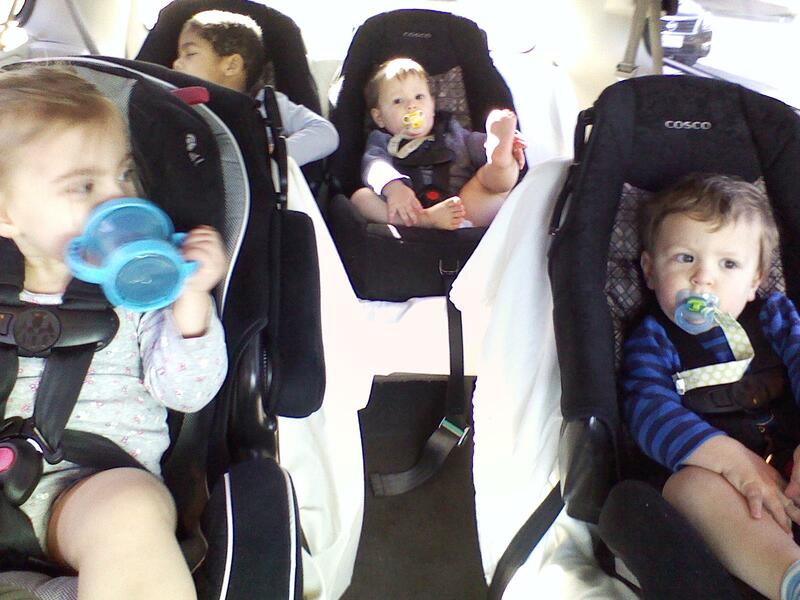 Postscript: Okay, okay, it’s been kinda awesome to fit all four kids in one vehicle. We have freedom to leave the house all together now. And, yes, its “utility can’t be beat”, as Mr. Okayest has said. And, okay, okay, it’s pretty cool to put regular gas in something for once, instead of premium. And, yeah, those automatic doors are really something when I have my hands full of twins. But, seriously, beige?!! Laughing my ARSS off at this!! Seriously! Also love the blankets under the car seats to protect the regular seats. We do the same thing in my “dreaded” mini-van. But it is true…they are just so much nicer to fit 3 carseats in than even an SUV. We tried the SUV for 2 months and traded it in. I’ll bring the spray paint cans! Yes please! Bring some orange or purple or neon green, ok? You forgot the silver 1991 (?) Jetta that we bought used and liked it so much that we bought the new 1994 maroon Jetta. Oh, dang! People of the world, I would like to introduce you to my mom. Okayest Mom’s Mom has rightly corrected me!